4pm on Friday arrived in the blink of an eye. It was as if all us Gaisce students were in the chorus of HSM singing 'WHAT TIME IS IT? SUMMER TIME!' With great excitement, we ran to SuperValu and grabbed all the goodies we could find, then sprinted to the bus. We couldn't wait. The hour long journey was filled with booming music, laughter and catching up on the latest Riverdale episode! On the way, we spotted the looming mountains and our hearts skipped a beat as we realised we would be climbing them that night and the next morning. As soon as we arrived, we gathered in the games room and were introduced to our guides. We then pushed our way to the rooms list to grab a room with our friends. We were shown to our rooms; ours was filled with 10 bunk beds. Then the clock struck 6pm. It was time; the hike had finally arrived. That evening, we hiked 10km. While the first hill was almost impossible to walk up (considering it was basically a vertical wall!) we made it eventually, and we were all extremely proud afterwards. Some of us even jogged the last few hundred metres! We all whooped with joy at the finish line, and scurried back inside to enjoy a delicious pasta dish, followed by ice cream wafers and biscuits. At 10:30pm, the guides called us to the games room over the intercom. We fretfully played a game of Heads Up, and then headed straight to bed. Well, bed as in staying up chatting and laughing all night long! At precisely 8am, the intercom burst into loud music, waking us up from our sweet dreams. Breakfast was served, followed by sandwiches, popcorn, fruit and millions of sweets. The last 15km of the trip stood before us. Could we do it? These last few kilometres were extremely hard, as we were constantly climbing up a gradual hill. At least our thighs and calves felt fabulously toned afterwards!! Hiking up the Cooleys was next to impossible, and the Haribos really came in handy to provide us with extra energy...!!! After we had finally completed the 25km in total, we collapsed on the benches and waited for the bus to bring us back to home sweet home. We were all so proud of ourselves for completing the hike, as we were the fastest year to do so! Overall, it was an amazing weekend and I can't believe I'm saying it, but I'd love to do it again! from the teachers. It was enjoyed by everyone and they memories will stay with us forever. Well, I never thought I'd see the day when I'd be standing on the stage of the National Concert Hall, singing to my hearts content! I remember asking my principal as a 5th class student if we could enter the Waltons music competition, but my request was denied as we apparently were not good enough to compete. Well wouldn't you know - we made it to the top 6 in Ireland this year, in TY! The theme of this years competitions was crossing musical borders, so we all put together a mix of three modern pop songs that suited this theme - Same Love (Macklemore), It's Alright Not to Feel Okay (Heathers) and Drive it Like You Stole it (from Sing Street, the movie). We added in a cello, which was played like a guitar, and a guitar which was played like a cello (crossing musical borders). We also used body percussion, rattled old coins in our pockets, and boom whackers. About 30 of us sang the songs along with the instruments. The end result sounded really professional, and being up on stage in front of the different schools and audience members felt amazing! 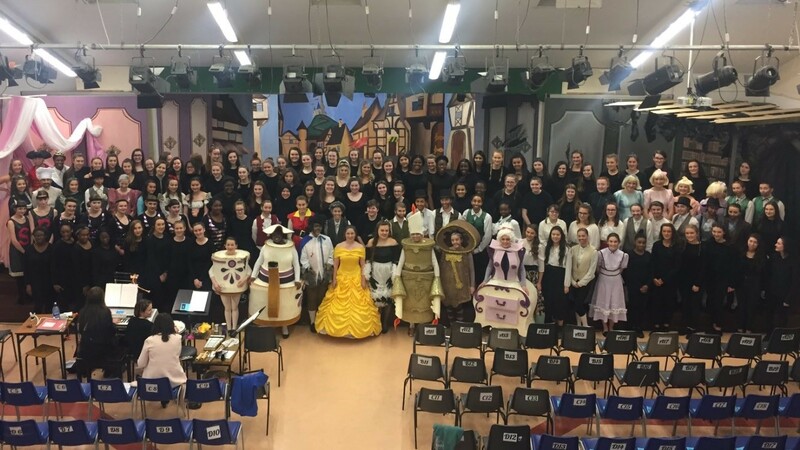 After all the weeks of time and effort we had put in after and during school, we felt really proud to have finally performed our finished piece. While we didn't place in the top 3, we still had the most wonderfully fun experience and day out in town with our friends. I can't wait to compete in Waltons again next year, and be in charge of rearranging the songs and music! 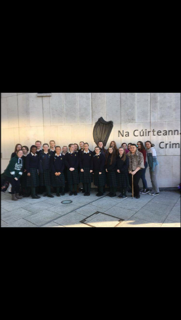 This years TY Mock Trial team had a brilliant day in the Criminal Courts on Saturday the 8th of April. 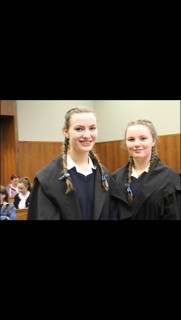 The team had a very unlucky defeat but performed very well in all three of cases. There were many different roles involved with our team. There were barristers, solicitors, witnesses, photographers, sketch artists and the research team.The barristers had to present the case in court and either defend or prosecute the accused. They had to prepare questions for witnesses and write opening and closing statements. 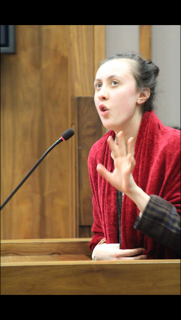 The solicitors had to advise the barristers on objections and help their witnesses to prepare.The witnesses had to learn of their statements and practise being questioned. When the day had finally come, all girls put their tiredness aside and performed extremely well. Unfortunately, we lost our final case but winning and losing aside all girls worked really well together and should be very proud.It was a brilliant experience. After weeks of anticipation, Thursday the 27th of April finally came. The Junk Kouture Grand Final. Jumping on board the 8:50 train, we were nervous and discussed the schedule that had been emailed to us. The 3 Arena was buzzing with excitement from the moment we arrived. In our dressing room, Ms.Lennon, Ms.Lynch, Nicole, Ayman, Niamh, Roisin and I were immediately hard at work getting the models ready. We were lucky enough to be put in a dressing room with lights and mirrors running along each wall. Our teams, Luster and Taped, ft to share dressing room along with a team from another school. This was the lap of luxury compared to the makeshift tables some teams got in the huge space that served as a communal dressing room for the day. Once the models’s costumes, hair and makeup were ready, the judges came around. They were impressed with our mood boards and our costumes. As it got later a large pizza was sent to each team (one of the highlights of our day!) Following this, everyone except for the models were asked to leave the dressing rooms. From this point forward it was a waiting game. 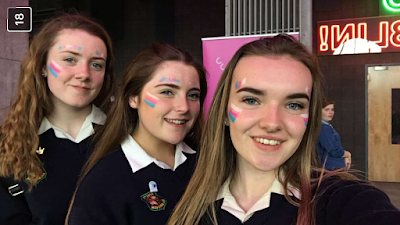 We were excited and nervous for our models and wondered what they were doing as we were at “fun in the foyer.” Here we were given face paint, wrist bands and power banks. We left with more stuff than when we arrived! There was an “art-off,” a Virtual Reality Studio, a variety of talks, meet and greets with Seo Linn, a 360 degree camera studio as well as other games which gave you the chance to win amazing prizes. Who wouldn’t join in when a Penney's voucher was up for grabs? 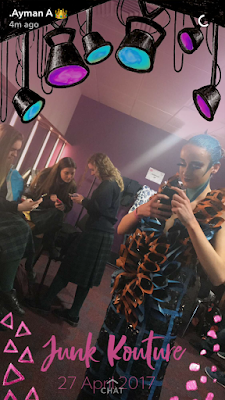 From the beginning of the fashion show, it was immediately evident with each team that a lot of work went into not only the dresses but the hair and makeup and the performances. 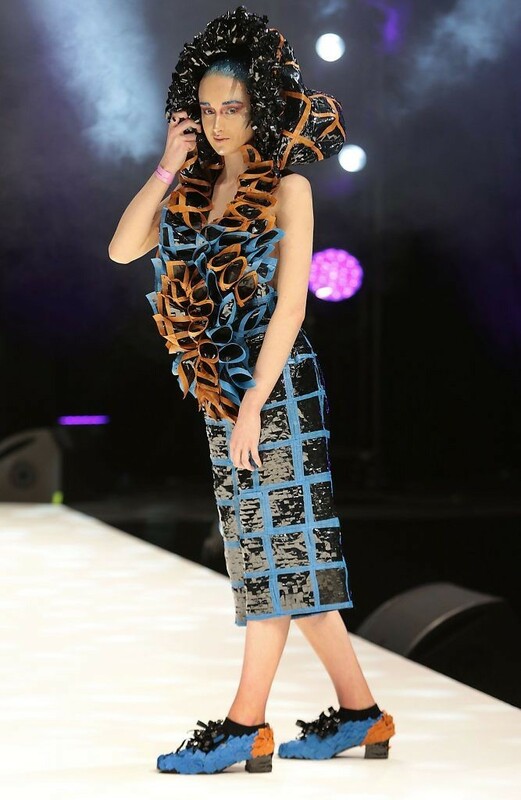 Luster was our first dress to come on stage, followed soon after by Taped. Ayman and Nicole’s performances were flawless- no one could have guessed how nervous they were backstage before coming on. A mass of supporters from our school arrived to cheer our models on waving the torches on their phones to the music. Unfortunately neither of the loreto teams placed in the Grand Final, but the hard work we put in was (to us) definitely something to be proud of. 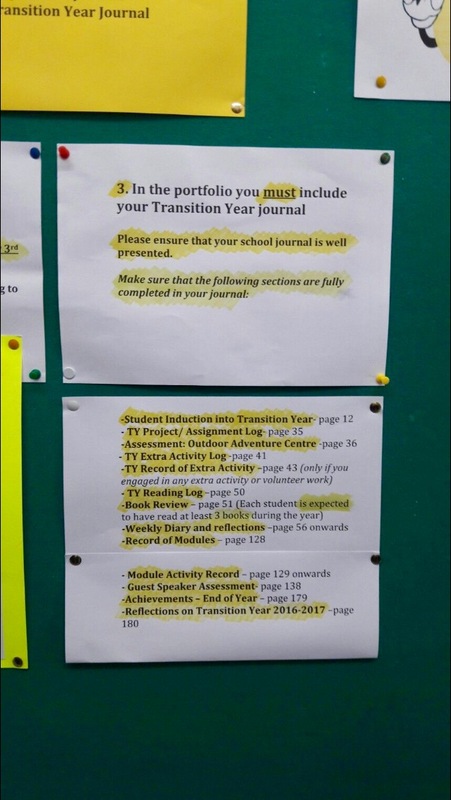 It is the most stressful time of the year for TY’s, interviews coming up, and most of us do not have everything signed, and no projects printed out. Also there is some of us that have no clue what we need, and if you are one of those people you have clicked on the right blog post. ● A folder with 5-9 pieces of work in it and along with that you will need the assignment record sheets. I recommend to include your English literacy journal and all of your module projects. ● Your work experience journal. ● Your module logs signed (those sheets in the back of your journal). ● Those 3 book reviews we were told about at the start of the year. ● Your journal completely filled out. Each interview lasts about 10 minutes, there will be two people interviewing you. Everyone who have done it already, have said it went really well and there was nothing asked they were not prepared for in the interview. If you have the work you need you will be fine!